Place the oven rack in lower-middle position and preheat to 425º F. Place the potatoes directly on the oven rack and bake until the potato is soft to the squeeze, about 40-45 minutes. (Double check the potato for doneness by piercing deeply with a paring knife). Remove from the oven and, if proceeding with the recipe immediately, maintain the oven temperature. (Or you can set the potatoes aside at room temperature for 2-3 hours before continuing, then preheat the oven to 425º F). When cool enough to handle, peel away the potato skins. Roughly chop the potatoes (do not mash or mince) into 1/2-3/4-inch chunks. In a 10-inch non-stick, oven-proof skillet, heat the oil and butter over medium heat. When the butter stops foaming, add the potatoes and season with the nutmeg, salt, and pepper. Immediately begin turning the potatoes to thoroughly mix in the seasonings, oil, and butter. Using a wide, flat spatula, flatten the potatoes to a smooth, solid layer. Reduce the heat to medium-low and cook for 5-8 minutes. Near the end of cooking time, shake and rotate the pan quickly in a clockwise motion to loosen the potato cake from the sides and bottom of the pan. The bottom should be browning nicely at this point. Place the skillet in the preheated oven and bake for 15-20 minutes until the top is crusty and lightly colored. Using oven mitts, carefully remove the HOT pan from the oven and let sit for 30 seconds, then immediately cover it with a serving platter (or a flat baking sheet if that is easier) and quickly invert to unmold the cake (or slide it from the sheet onto your serving platter). Serve immediately; whole or cut into wedges, or top the cake as follows. Enjoy! *Note-- before continuing with the recipe, make sure your serving platter is oven-safe. Otherwise, invert the cake onto a baking sheet. Carefully change the oven rack to the upper position, about 4 or 5 inches away from the broiler element. Turn on the broiler. Using a large spoon or off-set spatula, spread the top of the hot potatoes with the crème fraîche or sour cream and sprinkle evenly with the cheese. Place the cake under the broiler and broil until the cake is golden and bubbling, about 3-5 minutes. Carefully remove from the oven and serve. Enjoy! Yum! It looks fantastic. I'm definitely trying it. I know this may sound weird, but....this look AS delicious at the crepe cake!! I LOVE potatoes!!! Yum ~ can not wait to try this! Thank you! I do hope you try it soon. I am rushing downstairs to add creme fraiche to my grocery list. I know just what I am having for breakfast this Saturday. Thanks! This looks so fantastic! 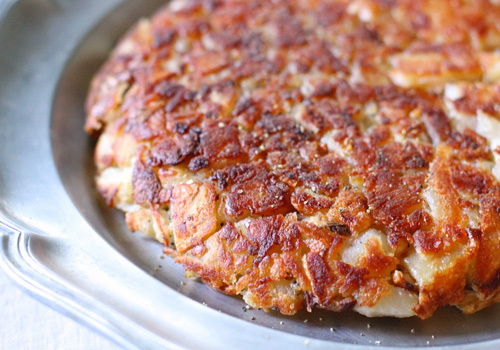 I love potatoes, and they seem to be even better when they get crispy in the oven! Would this recipe work as good with Yukon Gold? I generally prefer them to russets, but since they're so different I don't want to change it up without asking. What do you think? I love the flavor and texture of Yukons as well, but in my opinion it is best to stick with Russets in this recipe. Their fluffy texture and earthy flavor hold well when pan fried and seasoned.